Charles Krypell designs jewelry pieces that are meant to endure. He wants women to collect his work, each unique piece acting as an emblem of their past and an heirloom for future generations. To achieve this goal, Krypell knows he needs to imbue his jewelry with timeless style and individuality. That's why Charles Krypell's range of jewelry, from the necklaces to the rings, feature unique details sure to appeal to the modern woman. Krypell began his design career as a sculptor, and this influence is evident in many of his pieces. His favorite medium is silver, as this beautiful, versatile metal can be manipulated into myriad shapes and designs. 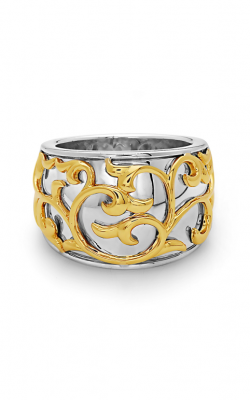 The Sterling Silver collection has long been one of the brand's most popular. This collection features a range of rings, bracelets, and necklaces, all of which bear the hallmarks of Krypell's craftsmanship. The pieces combine delicate design work with bold, eye-catching colors. They're embellished with many striking accents, including sapphires, pearls, diamonds, and gold. The juxtaposition of vibrant gems and delicate metalwork results in jewelry pieces perfect for any modern woman. These luxurious, sophisticated pieces can be worn out on the town, to an upscale cocktail soiree, or when you simply need an extra dose of confidence. Without a doubt, they're a worthy addition to any jewelry collection. The rings in the Sterling Silver collection range from sapphire-embellished pave rings to multi-tone rings embellished with ivy patterns. Some feature intricate metallic shapes, while others use the sterling as a simple setting for glorious gemstones. The bracelets are also distinguished by their delicate designs and bold embellishments. The Sterling Silver collection's array of bangles and cuffs are decorated with twining strands of silver, floral designs, and gemstones like amethyst and turquoise. Necklaces range from pave-encrusted pendants to strands of delicate sterling links. Charles Krypell knows earrings are the finishing touch to any ensemble, and his Sterling Silver earrings don't disappoint. From elaborate gem-laden dangle earrings to ivy-patterned hoops, these sophisticated options are made to please. Why Shop for Charles Krypell Jewelry at Long Jewelers? If you want to shop the Charles Krypell women's jewelry collection, you belong at Long Jewelers. For more than 30 years, we've been one of the premier jewelry stores in Virginia Beach, thanks to our wide selection of fine jewelry, fine timepieces, engagement rings, and more. Our showroom, which attracts customers from Tidewater, Norfolk, and Chesapeake, has been featured in august publications like InStyle. This is largely due to the work of president David Long, an experienced jewelry designer with his thumb on the pulse of the jewelry industry. For more information about our Charles Krypell selection, stop by our showroom soon!